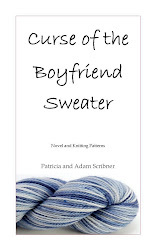 Curse of the Boyfriend Sweater, written by Patricia and Adam Scribner, is a novel featuring seven original knitting patterns. 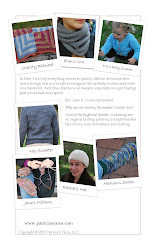 Curse is a tale of love, loss, friendships, and knitting set in New York City and Hoboken, NJ. Below is the introduction. Enjoy! In New York City everything moves so quickly. Seldom does time slow down enough that you’re able to recognize the carefully worked seed stitch on a hand-knit, dark blue, Merino wool sweater; especially on a girl blazing past you at rush hour speed. But I saw it. It was my sweater. I had spent months transforming ten balls of extra-fine Merino wool into a stunning gift for my boyfriend. He obviously never cared how much time I spent picking up stitches and making sure each knit and purl were perfect. Obviously, he never cared how I tailored the sweater just for him, taking clandestine measurements when he wasn’t looking or was dozing beside me. I spent all of my spare time on this beautiful sweater, sneaking in hours when Dennis wasn’t home in order to make sure it was a surprise. “Why was she wearing the sweater that I knitted for him? If I had taken the subway one more stop, I may never have gotten off in front of the Layton Imperial Hotel. But it was the first nice winter day in weeks, so walking seemed like a great idea. Snow was turning into an oozy mess at the curbside, the morning New York sun blazed brilliantly as it came up above the buildings, and even – big surprise for a January day – I heard birds chirping! They were tricked out of their winter slumber by this gorgeous day. Tricked, just like me. Dennis was supposed to be in Seattle on business. Dennis – Mr. Cool, Calm, and Collected –looked me in the eyes and said, “Jane, I’ll be home by Friday night. It’s just a quick trip to the West Coast for business.” God! And I believed him! I believed almost everything he said; after all, why shouldn’t I? He was the handsome advertising executive who had not only asked me to move in with him, but also provided a home and all the Tribeca amenities a 25-year-old girl could ask for during the past three years. Yet, there she was, with her tousled hair and slight grin. She looked tired, and happy, and – god dammit! – cozy in the sweater. Her evening dress draped down her slender legs from underneath the sweater. 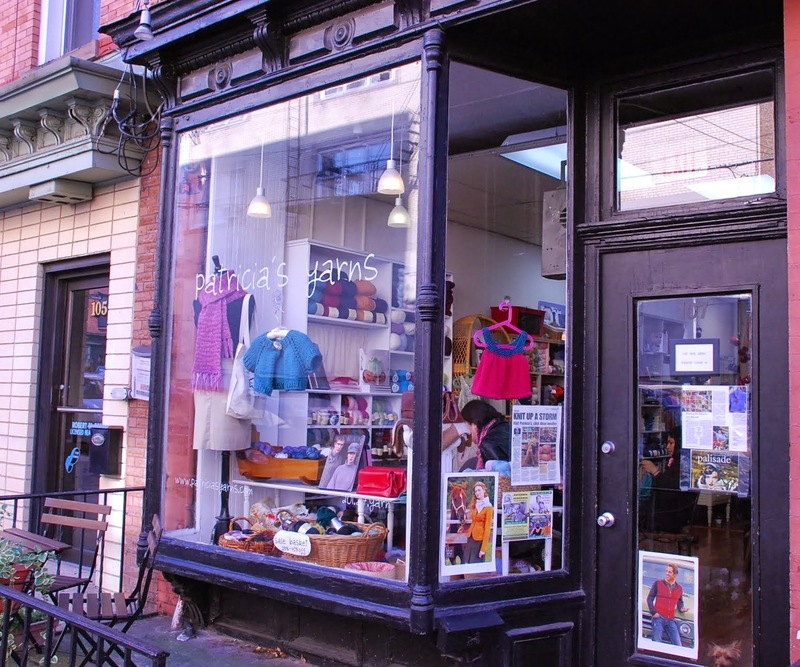 She was stunning, even when wearing a knit sweater and an evening dress, and she walked by so confidently and self-assured. He spent the night with her. And he gave her my sweater to wear home in the morning. How many times had Dennis lied? Was this the first time? Did our history together mean nothing? Was there ever really a history to mean anything in the first place? I wanted to yell at her, but I found I couldn’t move. After she walked past, my eyes were stuck to the pavement. Morning commuters jostled past me, some elbowing me aside, – “Watch out! Jeez!” – but I barely noticed. I couldn’t believe it. I couldn’t breathe. I felt cold, cold and alone, cold and mocked by the tricky January sun. Go away sun! All those hours I had poured into making that sweater for him. He didn’t care. I blinked back the tears that formed in my eyes. I will never knit a Boyfriend Sweater again! Do not use content from this site without written permission.